Spinal stenosis occurs as a result of congenital or acquired narrowing (stenosis) of the spinal canal that may occur in any of the regions of the spine, including the lower back (lumbar stenosis), neck (cervical spinal stenosis) and upper/middle back (thoracic spinal stenosis). This narrowing causes a restriction to the spinal canal, resulting in a neurological deficit. Symptoms of lumbar spinal stenosis include calf and leg pain, and fatigue when walking, standing or lying supine. These symptoms disappear when flexed, or in the sitting position. Usually, patients exhibit a simian position with a forward flexed trunk and slightly bent knees when walking to decrease symptoms. Patients also complain of numbness, tingling, weakness and lack of coordination. Muscle spasms and back pain, as well as referred pain to the upper and mid back are also common. In severe cases varying degree of lower extremity weakness and bladder and bowel symptoms may occur necessitating surgery. There are several causes including aging, thickening of body’s ligaments (ligamentum flavum),bone spurs that develop on the bone and into the spinal canal, Intervertebral discs bulge or herniation into the canal, enlargement of facet joints into the canal, compression fractures of the spine, cysts formation on the facet joints causing compression of the spinal sack of nerves, tumors that grow into the spinal canal, etc. 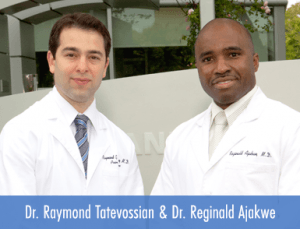 The medical history is the most important aspect of the examination as it will tell Dr. Reginald Ajakwe and Dr. Raymond Tatevossian about subjective symptoms, possible causes for spinal stenosis, and other possible causes of back pain. The MRI has become the most frequently used study to diagnose spinal stenosis. The MRI uses magnetic signals (instead of x-rays) to produce images of the spine. MRIs are helpful because they show more structures, including nerves, muscles, and ligaments, than seen on x-rays or CT scans. MRIs are helpful at showing exactly what is causing spinal nerve compression. A CT myelogram is useful in patients in who an MRI cannot be obtained. A spinal tap is performed in the low back with dye injected into the spinal fluid. X-Rays are performed followed by a CT scan of the spine to help see narrowing of the spinal canal. This is a very effective study in cases of lateral recess stenosis. It is also necessary in patients with a pacemaker as they cannot undergo an MRI. Spinal Stenosis is best treated with a multimodal approach. Physical therapy including heat modalities and deep sedative massage, combined with NSAIDS and muscle relaxants can be a good starting point. Lumbar epidural injections with local anesthetic and a long-acting steroids can be effective in providing excellent short term relief. These injections can be repeated at reasonable intervals. Anticonvulsant (Lyrica/Neurontin) and Antidepressants (Cymbalta) can also help for neuropathic pain. Surgery is indicated in severe cases.